Everyone has a lot to say about which kitchen design trends will be huge this year. From HGTV to Houzz to any other number of home design websites, you can find top 20 lists that throw a few pictures and a lot of words your way. But it can be hard to know which trends are worthwhile pursuing, and—perhaps more importantly—which ones will work in your house and your neighborhood. We’ve narrowed down the ever-growing list of 2015 kitchen design trends. We believe the five trends highlighted below are only growing in popularity—and we doubt that they will go away any time soon. Furniture features: Islands and lower kitchen cabinets are starting to pull in unique furniture features, which eliminate the bulky design that often comes with traditional kitchen pieces. The greatest benefit of furniture-styled cabinets and islands is that they truly make your kitchen feel uniquely you. 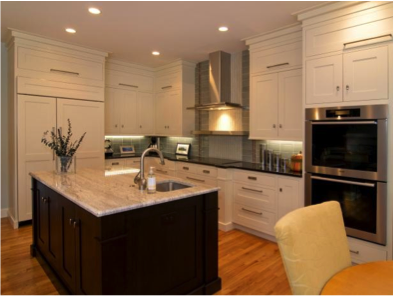 Shaker-inspired design: Shaker kitchens emphasize function, clean lines and comfort. As the kitchen continues to reign supreme when it comes to the most used room in the house, these design aspects will never go out of style. 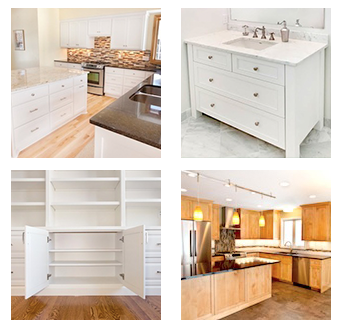 The most common place to incorporate the Shaker style is in your cabinet doors (think wood detailing and paneling). 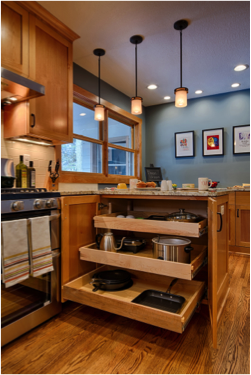 Pullout drawers: Speaking of function, one of the ways to make the best use of space in your cabinets is to incorporate pullout drawers. They allow for easier storage and easier access—two things everyone clamors for when upgrading their kitchens or even buying a new home. Open shelving: This trend really hit the scene hard last year, and continues to draw attention. And here’s why: shelves without doors automatically open up a room. The more open shelving you have the more open your kitchen feels. So if you a small kitchen or galley kitchen, absolutely considering incorporating open shelves into your design. Bright color: Gone are the days of muted tones in the kitchen. When used properly, bright paint colors or bright wallpaper can really bring life to your kitchen. Or you can opt for a calmer color on the walls, which would free you up to make more of a design statement with bright custom cabinets (all-black cabinets are growing in popularity). What do You Think of These Kitchen Trends? Do you think we have it right? Are these design trends going to be hot this year? Should we have included others that you feel might last longer? Tell us what you think! Leave a comment, or share your pics with us on Facebook or Pinterest. We also would love to hear from you directly, so feel free to send us an email or give us a call. You can reach us at 952-737-7088.